Well it is a beautiful day in Calgary so I thought I would get some daily practice painting on the deck. It wasn't long before the kids decided that they wanted to paint too. 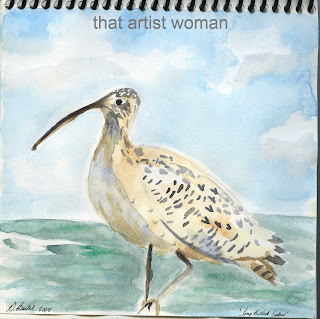 We found a picture of a curlew in my reference photos and got to work. 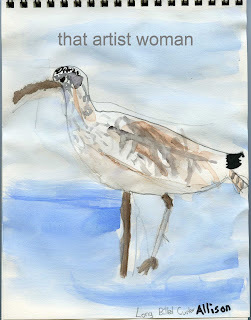 I enjoy painting birds as they are some of my favorite creatures however we are still practicing. This is by my middle son. and mine. Like I said we are practicing. 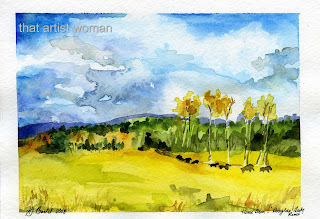 How nice that your children would actually sit down and paint--and what great paintings! My "husband" Peter took his parents (his mom was dying of cancer) to the Keys last year for an impromptu vacation; Peter's sister and her daughter went too. 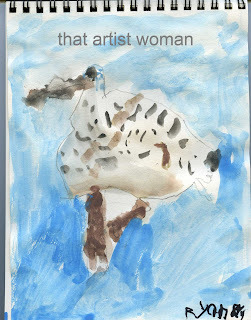 I couldn't go but sent a watercolor set with them ... Each one painting a picture of a palm tree. we framed the five together, and it's now a wonderful remembrance of Peter's mom.